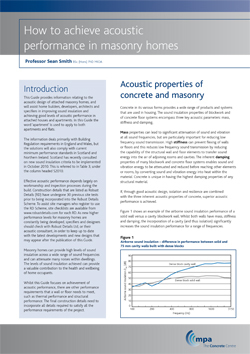 Good sound insulation by walls and floors is easily achieved using the inherent mass and damping qualities of concrete. The need for additional finishes is minimal, thereby reducing capital and ongoing maintenance costs. Noise control in buildings for residential use in England and Wales is regulated using Approved Document E. This Building Regulation applies to any kind of building used as a dwelling, including houses and apartments; and rooms for residential purposes, such as students and nurses accommodation, nursing homes and hotels. It also applies to dwellings that have been created as a result of a conversion or material change of use. The aim of the regulation is to protect residents from the noise of activities in other rooms or adjoining properties. This has been highlighted as a major cause of tension between residents. The acoustic requirements are shown in tables 1.1a and 1.1b. Robust Details provide high performance separating wall and floor constructions that are expected to be sufficiently reliable not to need the pre-completion testing normally required by the Building Regulations. The majority of details illustrated in both of these sources are of masonry and concrete. Additional guidance is provided by actual test results. For further information please refer to the acoustic test reports below. These comprise of acoustic reports from a selection of real projects with various floor and partition solutions and different arrangements of finishes and can be used by designers as another source to indicate the likelihood of similar details passing pre-completion tests (PCT). Below is a summary of the concrete structures tested. Click on the name of the project to download the full report. both sides. Mineral wool layer continues to mineral wool mat laid on floor planks. 200mm thick Structherm Fastbuild solid concrete wall panels. above 15mm thick plasterboard with plaster skim. to separating wall and supported on separating wall panel. plasterboard-on-dabs, and finished externally with 60mm of expanded polystyrene combined with a proprietary render. chipboard (floor) and plasterboard (ceiling).